"Italy-Tours-in-Nature": the Ethos Behind it. "Italy Tours in Nature" is the condensed product of many years of traveling and researching various parts of the country, with the idea of gathering information ready for you to use. When you plan a holiday, it is always a challenge to decide what to see and what to leave out. Naturally, you want to make the most of your limited time, and planning is a time-consuming activity – especially so if you're traveling to a foreign country. Of course, you may well enjoy doing that – but if that is not the case, I have done all the hard work for you! I organize Tours in Nature in various parts of Italy, those that I know best – first and foremost in the Dolomites, Trentino and South Tyrol, but then also in the Cinque Terre region and the Portofino area in Liguria, the Apennines, and some parts of Emilia-Romagna. Other areas will follow as my knowledge and level of expertise increase. My tours are lovingly put together by my passion for the Nature of Italy – and by my pleasure of sharing it with like-minded people, just like you. The aim of this page is not so much to give you information on forthcoming tour dates – for which there are other spaces in the website – but rather to provide some background on my way of organizing tours, and a general outline on my philosophy of traveling. Let me start by pointing out a couple of important things. Even if in my tours I am very keen to make the most of the time available, the focus is also on a slow approach – a similar ethos to that at the foundation of the "Slow Food" movement, which you may know, whose goal is to celebrate diversity and local productions. I really do believe that we have to rediscover the 'slow' dimension to life, whether in eating, traveling, enjoyment of nature or art – and of course 'slow', in this context, does not mean 'lazy': it means rather that in my tours we will concentrate on a few selected things, but we will take the time to fully savour them. So, if all you want to do is to whiz through Italy glimpsing snippets of it in a couple of weeks... well, this is not what you are going to find here. What you will find, instead, is a dedicated, in-depth approach, often very localized geographically. Another aspect I feel the need to make explicit is my way of running tours. I tune in with the reality I am immersed in, and my knowledge of the areas where I operate mean that there is always a definite focus on making the most of the "here and now". In fact, a dedicated participant called my trips – and here I quote her own words – "Serendipity tours", given my focus on "seizing the moment"; perhaps I would use the word synchronicity instead, but the idea behind it is similar. But with this I don't want to worry you; in fact, quite the opposite: this is meant as a reassurance. For any given trip, obviously, there is a programme, and – included with it – a list of the places we will visit, but it is the 'how we will vist them' that can vary greatly. Because I want you to have a great experience, I also want to make sure that I take you to the right place at the right time. Could I take a group on a high-altitude trek on a day in which heavy storms are forecasted, just to be faithful to a schedule – if another day with more suitable weather is available? That would be silly, would you not agree? This is why in the outline of my trips I list the places that we will visit, but I will not indicate the order in which we will visit them. So please take a programme as an indication of what you will see, but remember that the order is not set in stone. And as for where you would be accommodated, the establishments I rely upon are all tried and tested for their high quality standard and friendliness. They will all equally put you in touch with an authentic experience of staying in unique setting that retains something quintessentially Italian and regional in its identity. These establishments are also run by dedicated and passionate people, like me – just to make sure, once more, that you will enjoy a fully-rounded experience. In the Summer of 2016 I will offer the following trips and excursions. The Registration for the following trips is Open. Please contact me with a message in order to have more information on the program and costs. Five days from Monday, July 4th to Friday, July 8th, 2016. – This stay is set in the beautiful scenario of Sauris, in the Eastern Alps, in the verdant region of Carnia, at the margins of the beautiful Dolomiti Friulane and not far from the Julian Alps either, which are also in sight from here. 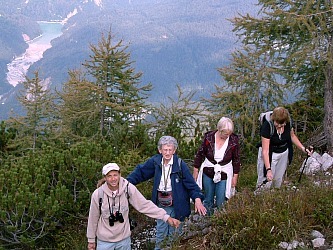 We will take daily excursions at the discovery of the wonderful flora of this corner of the Alps. The program includes a variety of visits: from local herb gardens, kitchen gardens and allotments, to establishments who grow and process herbs, to a day spent in the highland plateaus where only Alpine plants grow, to lower level meadowlands. The program also includes a one-day excursion to the amazing facility of "La Polse di Cougnes", a botanical garden set in the historic township of Zuglio, at the heart of Carnia. Six days from Monday, August 8th to Saturday, August 13th, 2016. – This residential stay is organised in the region of Alpago, near Belluno, one the three "capitals" of the Dolomites' region. It will take in the visit of two important botanical gardens within the area, the Alpine Botanical Garden of the Oriental Alps, on Monte Faverghera above Belluno, and the Cansiglio Alpine Botanical Garden, set in Cansiglio﻿ne of the most atmospheric areas of the Belluno region. 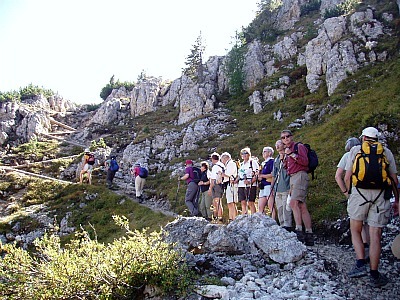 There will be also an excursion in the altitude of the Vette Feltrine, in order to discover 'live' the amazing flora of this corner of the Alps, so important to prompt a creation of a National Park (the Dolomiti Bellunesi), as well as a daily trip (by train) to Padua, seat of one of the world's oldest and most renowned Botanical Gardens, certainly the foremost in Italy to this day. Six days from Sunday, September 11st to Friday, September 16th, 2016. – Trieste has the beauty of the azure Adriatic Sea: in this corner of Italy the classical beauty of the Mediterranean landscape is tempered by the first hints of the Slavonic worlds, as well as the Alps, which provide an almost magical backdrop to the area. The long-standing Austrian-Hungarian presence can still be felt in the air, and has left many traces in the landscape, in the cuisine, and in the local customs. The Carso is in fact one cultural and geographical entity, even though it now belongs to two different countries. It is a region known far and wide for its geological features – so important that they even gave their name to a whole series of geological phenomena (defined precisely as 'karstic'). During this trip, we will walk the Rilke's Path near Duino, visit geologic ('karstic') and botanical features, and will also take a daily trip to the World Heritage Site of the unforgettable Škocjan Caves, in nearby Slovenia. Six days from Monday, September 26th to Saturday, October 1st, 2016. – The Dolomites capture the imagination for their stunning peaks, seemingly coming out of the dark green of spruce forests. The name 'Dolomites', almost speaks for itself as a synonym for "magical mountains", with remarkable geology, charming towns, and delectable fresh local food and wine. The Dolomite Mountains are also a UNESCO World Heritage Site. We will experience many of the serial properties of the Dolomite World Heritage Site during our stay, including the Tre Cime, the highest peak of the Marmolada, the Sciliar and the Bletterbach gorge. The trip will include a series of highlights from all three main Dolomites' regions (Belluno, Trentino, South Tyrol). The majestic peaks of the Dolomites – with their immense views – offer the incredible experience of walking on what was once the bed of an ocean. We will trek on historical trails, taking in the grandeur of nature as well as the cultural, artistic, historical and gastronomical plenty that this region has to offer. We will also be talking some memorable meals – and did we mention the wines? This trip is itinerant, with overnight stays in different locations, including Cortina d'Ampezzo, the Val Gardena and Fai della Paganella, near Trento. – The Julian Alps are renowned for their scenic beauty, Slovenian culture, and gastronomic specialties. Please note: The Dolo-Slovo Rocks! that was planned for June 21-30, 2016 has now been cancelled. Tom and I are hoping to offer this trip at a later date (to be announced) in 2017. More information on the schedule of Tom's other trips can be seen in his website, as indicated in the link just above. 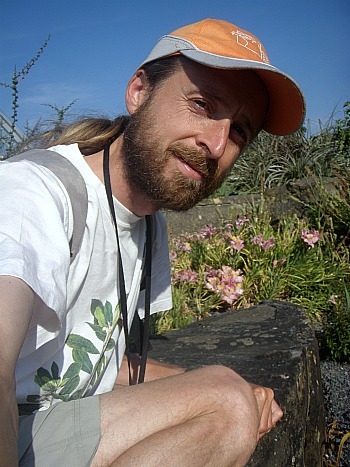 In the summer of 2014 I have teamed with Tom Williams of Williams 'GeoAdventures' on a Geology Field Trip to Southern and Northern Italy from June 7-16, 2014. I have accompanied Tom and his group on the northern leg of the trip from June 7-16. We have visited the Naples area (including sites such as the Vesuvius, Pompeii, Herculaneum and the Phlegrean Fields) for three days, the Cinque Terre also for three days, then crossed the Apennines (stopping in the Berceto area) and eventually stayed in the Dolomites for four days. Tom was teaming with Alan Clewlow of Volcanic Experiences for the southern leg of the journey from June 1-9, and together they have explored the geologic wonders of Sicily and the Aeolian Islands. The entire trip has included visits to six UNESCO World Heritage sites! The trip was a great success!!! Check out the Williams GeoAdventures website at www.geology-adventures.com for more information.